This week's winner is CRAFTYHOPE! Congratulations! You have won win a ceramic pendant and bead bundle from Gaea Handmade! Send Gaea an Email with your address and she will get your prize out to you soon! I have been asked so often to see my studio, I figured this was the perfect time and the perfect place! I can't begin to tell you how hard it was to get this photo, getting the angle right and the placement for the camera... The space is what you might call "small" or "petite" lol but you get the idea. This room has dual purpose. I am first and foremost a jewelry designer and I am also an avid scrapbooker. At least I used to be... funny how beads have taken over my life and left little time to create with paper. Yup! You are seeing this right! When I run out of room on my work benches I end up working on the floor. I can't help it! I NEED to be surrounded by beads to be able to fully feel the inspiration take over! Those are my knees...ouch! I am getting too old to work like this. Maybe someday I will have a better space to work in. Where do you end up working that is out of the ordinary? 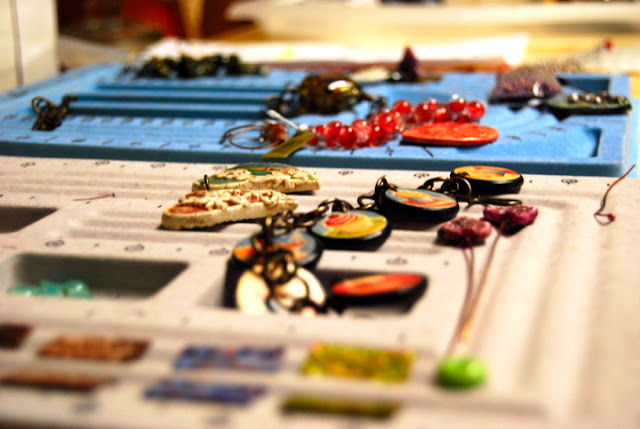 Do your beads take over and push you out of your studio or are you a meticulous artisan? Leave a comment answering any of these questions and you will be entered for a chance to win an assortment of Skye Jewels wooden pendants selected especially for you, for your jewelry designs! Nice and cozy little place you've got there! Looks like you had to climb a ladder to get this angle. right now I am beading from my chair in the living room, because my beading room is in a shambles dut to work being done on my poor old houses foundation, everything is pushed to the front of the room........and will be that way probably till the end of summer.......and no I am not meticulous.....creativity is a messy process! I actually wind up taking my beads to work and doing beadwork between phone calls (reservations agent). Since a lot of my work is beading costumes, this works out just fine. And my co-workers always stop and admire. Oh Sista I feel ya. I do the same thing and work on the floor and sometimes end up in the hallway. I would call that meticulous, wouldn't you? I think I finally found someone with a smaller studio than mine. You do have to be super organized don't you? I, unfortunately, am not. Eventhough your studio is petite, I love the cheery colors and that everything has it's place there. My studio is actually our dining room. The dining table is where I work,label,package,keep files etc. So you can imagine how cluttered it is. Many times I'll be down on the floor, just like you, sorting through my beads, trying out different designs etc. One of these days I hope to have a real studio. Thanks for sharing yours with us! The kitchen counter was my first bead space and my supplies were always so neat and tidy because I always had to clean everything up so I could make dinner. It all fit into a rolling cart. But as things got going in my business, I took over a spare bedroom and now I'm sorry to say it's a bit of a mess, because I don't have the daily need to clean off the work table to prepare the meals. Skye Jewels studio gives me inspiration to get organized! Thanks for the post. I just tend to enjoy the sun and flora fauna around me...often take my stuff a garden outdoors and handcraft my jewels. So yes, this does make me meticulous because i cant carry it all out! I don't really have a studio for my beads. I do for my glass, but it is so disorganized right now I couldn't get anything else in there. It's also away from the house and I usually end up beading in the house in the evenings, so I end up spreading everything out on my dining room table and then working on a dinner tray in my love seat. A little uncomfortable at times and not very much room, but I enjoy it. Marie,thanks for sharing a view of your studio..it's lovely..
My craft area is currently a corner of the living room, so I have to keep it *generally* clean. But I have been know to pack *some* beads to take on vacations, and fishing trips. Your space is small (like mine) but well-organized (not like mine)...thanks for sharing some great ideas, as I'm in the process of redoing my studio. 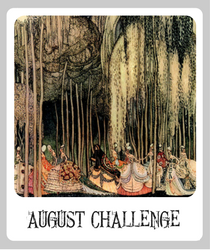 Love your work, and would love to be the winner of these beautiful pieces! "meticulous artisan?" I would love if that were me! No, I really frustrate my husband because I be everywhere. Right now, I am restringing pearls and beads for a high end jewelry store. Usually, this happens after dinner and I am sitting on the couch with a little table in front of me. I also love to bead in the car on trips, because the lighting is so good! I love your studio. I too have commandeered a small bedroom for my crafting needs, though I don't create on a large scale. Even so, I find myself going out into the dining room, spilling over into the kitchen, bedroom or out on the screened porch. Like you the creative juice seem to flow better when everything it out and I can see it all at once, but that leaves little room to actually assemble things. Great post! Your studio may be petite, but it looks cozy, and I love the way you organized it! Sharing space can be fun. You can work in the same room, seperately but still without feeling lonely all the time. Chattin, listening to music and joking while working can be useful when doing some boring and tedious but neccessary tasks. But it also means not just dealing with your own mess, but with someone else's too! And to tolerate that someone has other ideas about how tidy the workspace should be etc. It can escalate into conflicts if you don't have the same ideas about who should tidy up and when a mess have gone too far. Being sisters makes it also somewhat different than sharing space with a friend or colleague. In some ways better, but in others worse! I'm like you in that I love to have everything spread out around me as I work! My cutting table is typically covered in a rainbow of beads so I can 'see' everything, and my working table isn't much better. I do have a lot of boxes for my beads but really, they don't shout from there, I have to see them, all! Très joli ce petit coin Marie. De plus je trouve très romantique tes créations sur bois. My poor, cluttered dining room table is my "studio". And if I don't have enough space to work there, I will move to the top of my bed so I can lay out ALL the beads I have so I won't miss ONE bead to choose from. What a cute space! 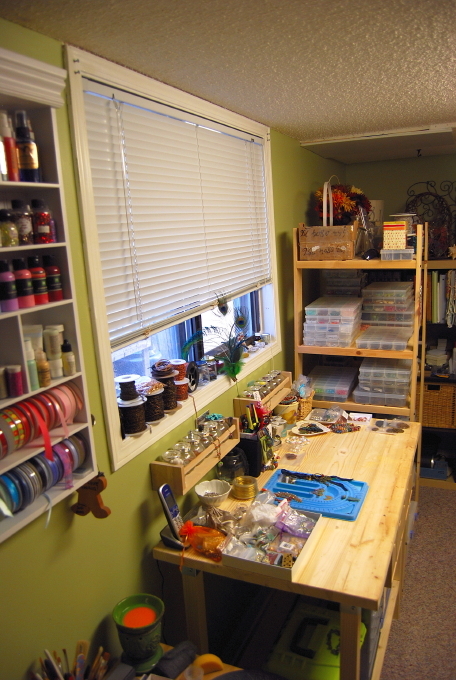 I have a corner of the garage set up for lampworking, then a table in the bedroom set up with clay and beads that always gets moved out to the dining room and takes over everything til we have company over and I put it all away. Marie, this looks awesome! I hope to get a work space in tact before the kids get out of school...it's coming up quick, they are out by May 23! Thanks for the inspiration!! I love your studio! It may be small, but it looks like you have a section for each type of work you're doing. It looks very cozy. Right now I share a space in what I refer to as my grandson's bedroom. My work table gets piled up pretty quickly, and soon I'm using his bed. Which means when he comes to stay, I have to make room. It's nice to a peek at where all your beautiful creations come from! I see one thing missing, a swivel chair! What an amazing studio, you've utilized every nook & cranny! Shelving for your paints, ribbons, ect! I love having everything visible and within reach, too! I used take over the dining table, playing bead tray shuffle, just so they were all laid before me. Fortunately, now I have a big table in my studio(spare bedroom)for the spread! Thanks for sharing your homefront! I do most of my beading in front of the computer ( i have a keyboard that tucks away beneath the desk so I don;t continually loose beads between the keys ;) ) . I usually either have music or an audio book playing while I work. Well, for the time being I'm beading on our dining room table. My bead stash is still rather poor so I haven't had problems organising it until now. Nonetheless there is a small room in our house used as a guest room - home office, which I'm thinking of organising it into a studio. I'm going to need one soon. I've always enjoyed taking sneak peeks on other peoples studios.So many ideas! It must be like paradise working surrounded by so many beads. I like beads, what can I say!!! Oh, I love your little studio. It's very cheery and organized! I too have a scrapbooking addiction in addition to glass and beadwork. My space can easily get overwhelmed and out of control! Sometimes in the midst of a creative streak, it's just easier to find a new place to work (such as the floor) rather than clean up my workspace!! Thanks for sharing your studio with us. My beads are in a box next to the desk where I bead, a plank across two filing cabinets. The desk also functions as nightstand, computer and accessories surface and makeup table. When the box gets too full I take out what I'm not using and store it. You can see I really need more beads. Enjoyed seeing your "cozy" studio! I love the floor, so much space! I also make linked bracelets in the car and recently took a flat cake pan of beads with me to the couch (too ill to sit up in my studio chair). Made many memory wire pieces this way. Nice collection of pendants! What a great space! Good that you at least have a small room to keep things in. I am currently cramming things in bins off to the side in the dining room and on my bookshelf to keep it out of the hands of my kids. :) I end up spreading everything out over the kitchen table when I am working on a project. Thanks for the opportunity to win one of your pendants! I love your studio, all neat and organized! I also used to love getting on the floor, but the back and knees will not let me anymore. I have claimed a small corner in what used to be an L-shaped bedroom. We built a walk-in closet in there and the area that remained, my daughter and I claimed as ours. She paints and I bead! The bead area is not yet organized, but yours is certainly inspiring me to get in there and get busy! In the meantime, I spread it out on the kitchen counter. There is wonderful light in my kitchen! I am close to having no room at my beading table. To be honest, my space does not inspire me but it was the only area where there was room in my teeny house. I usually end up beading in the bedroom or my computer desk. Cute studio! I have a small but nice (and messy) place to work but my favorite place to do putting-together work is in BED! It really is the stupidest place to work but it is so comfy! I really should've been a knitter. 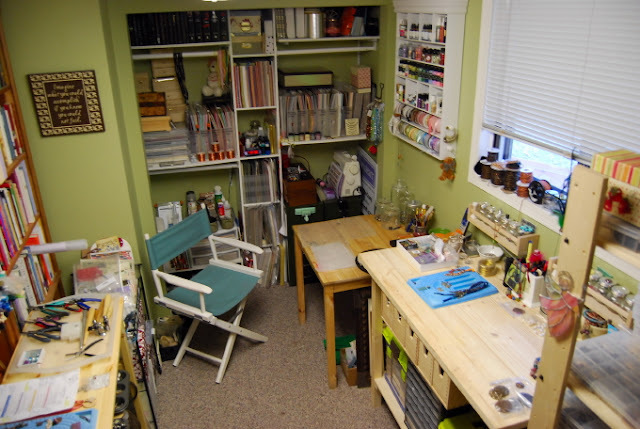 I loved seeing your studio and I'm consoled that mine is not the only one with beady clutter. I often spill out into the living room. There are beads scattered on the coffee table. I often bead sitting on the reclinder with one of those lap desks. Oh Wow! Thanks so much for sharing photos of your space. I have such a small space to work with as well, and I haven't quite figured out how to make it work, yet. I turned a walk-in closet into my studio. I purchased a very expensive bead chest to put all of my treasures in and I still spill over to the dining room table, all of the living room end tables, every spare closet in the house, the spare bedroom, and every empty drawer. Friends say I they are going to have an 'intervention'. Our oldest daughter leaves for college in the fall and she knows I am keeping an eye on her bedroom! It's been a while since I sat on the floor and worked - though I used to do that when I started, sit in the living room and watch tv while I made pieces - but I am pretty sure I have worked at every table I've ever owned. And almost every friend and family member's table. And the tables at every coffee place I've gone to more than once and most of the libraries in two cities. For the clay stuff, because it picks up dirt and mess, I do most of my work in my studio at my studio tables. In my previous apartment though, that meant anywhere in the apartment. Here I have a room set aside. Love your space. If I got on my knees like you do, I'd never get up!!! Getting old is not for sissies!! I have a smaaaaalll bedroom that I use as 'My Studio". Beads are in plastic containers that I got at Wal Mart for 1.97 and 2.97. They are arranged by type: round, bicone etc. I find if everything is neat and tidy I get into a funk and can't create. What a great little space! I love the fresh green color on the walls. I chuckle at your bit about getting the studio clean enough to photograph. Mine looks like the crew of Bead Hoarders is about to bust through the doors. (If that were a real show I am convinced that I would be on it!) I am like you in needing to surround myself with beads and things. If I can't see them I don't use them and then I buy more! I used to sit on my floor and bead at the coffee table, but that got too hard on these old knees. I have a very nice L-shaped desk and several tables and really nice cushy rolling chairs! So cool to see where you create. Someone will be very lucky indeed to win all these goodies from Miss Marie! Enjoy the day! I love your little studio! As for where I do my crafting, I don't have any place unusual but I don't get to work at my worktable either. It's always full of stuff I'm trying to match up for projects. And my secondary table in the dining room is also full of stuff, ongoing projects and a sewing machine, with all its related stuff. So mostly I work while sitting in the recliner with a cat on my lap!! What a great space! Your studio is inspiring. I love how organised you are. I don't have a studio, so I keep my stash/supplies portable. I have a large chocolate tin that I take across the country with me! Everything (well, mostly) is in little bags in side. 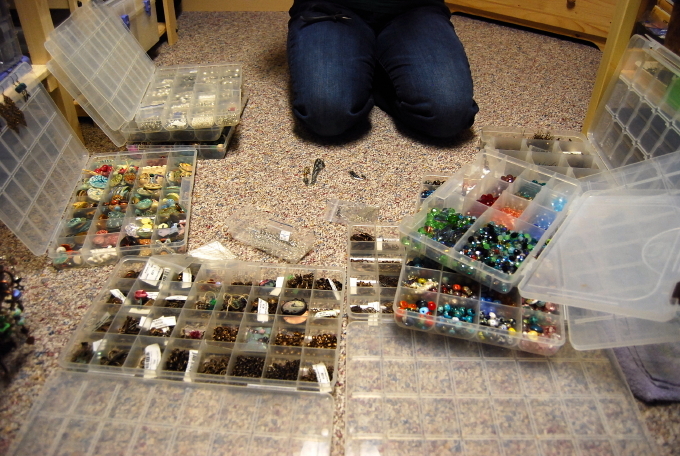 When I bead, I sprawl them across a table and work as long as I can, then pack it all up again. Thanks for sharing your creative space. I think it looks SO organized! I had to smile = I work on the floor as well! I seriously make my jewlery, more often than not, right on the floor. Your floor shot reminds me of mine! You have a great little place ! Right now I have my studio in my bedroom and it sometimes spreads out into the living room where I spread out my bead boxes to see what can be used by my muse!! We are planning on buying a house so I can have my own studio I caqn't wait ! Thanks for the chance to win some of your beauties! Your studio is small, but bright and cheerful! I have a small corner of the guest bedroom for my "studio". I started with an L-shaped desk, and occasionally used a folding table to hold the "overflow". Now the folding table is "permanent", and it's full of recent purchases, and items I can't fit into a catagory, to put away. If I put them away as "miscellaneous", I might never find them again!! Luckily, any "guests" that might stay in the room understand my bead habit!! Hi Marie, Love your blog by the way. My tiny little space defines the term 'unfortunate'. It's really unfortunate that I sit beside a furnace with a box of kitty litter behind me and a washer and dryer a few feet away. And it's unfortunate that I have to stand up to reach for some beads, bend down for others, and get under the table for yet more beads. I've become really creative in finding space, making space, and generally making it work for me. 'Cramped' just hits the tip of the iceberg form me. Oh, but at at least I get my laundry done. Love this studio! What a great way to use such a small space. So many of us artists fight to create a creative space in a small space. Great jobb! your studio looks perfect. mine is a mess so i am forced to work elsewhere in the house. i'm new to jewelry so finding the appropriate lighting is challenging. currently i do most of my beading in the kitchen. but i hope to have a space set up soon. Studio space would be so wonderful. If only I had some...SIGH! I currently work on a small glass top kitchen table...and have to have beads everywhere when I work. I keep most everything in a rolling plastic storage container with several draws. Other beads in plastic storage containers as well. I'm pretty compact so when I have to clean up it is fairly easy. One of these days I hope to have a studio/craft room...thanks for sharing yours!!! I actually have quite a large space but it's not very well organized. Oh and I have to clean up my work space before I start a project. 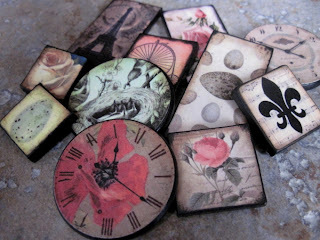 I am so jealous seeing those stuffs for jewelry making plus scrapbooking. They are really organized-well even there's so much stuff. Thanks, I am inspired to organized mine same as yours.